I have a problem I could not solve. I am doing a poster in Corel Draw X5, and as it is a physics poster, I need to put mathematical equations in it. The Corel built in text editor is just completely not enough for that, and as far as I tried I couldnt' find any way to transport (graphically!) a mathematical equation created in word 2007, into Corel Draw, other than making a JPEG file of it! And to do that, I need to do a full zoom of a pdf file created from the word file, and then do print screen many times, and put them together, to at last have my equation in 4000x300 pixels resolution. Lower resolution and it's REALLY poor quality, because it's all in length, so characters are small! Even acrobat pro cannot do me a 1200dpi jpeg file when saving as jpeg, it's even worse than print screen! 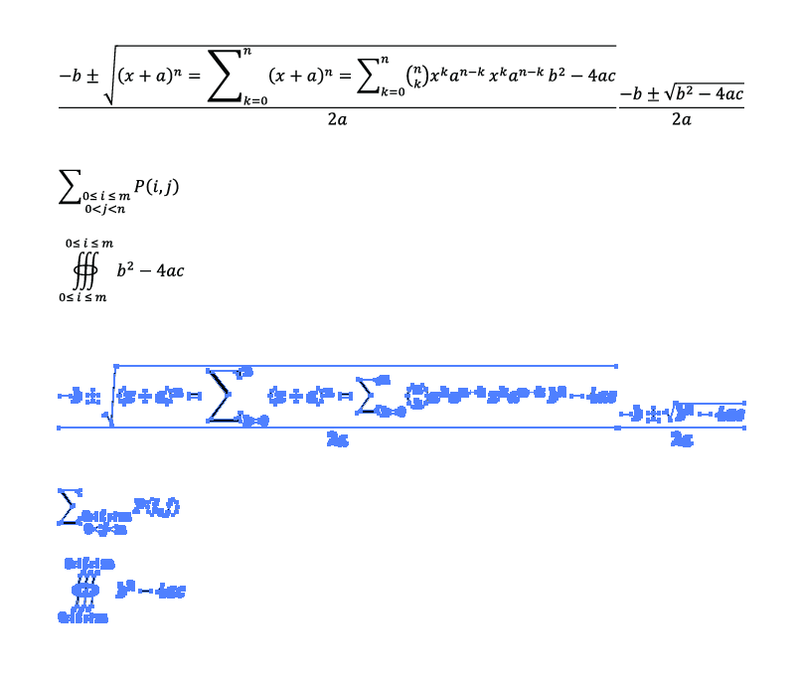 So for now I will just take a lot of time to obtain High res JPG versions of my equations...by putting together several screenshots...because no matter how much you zoom in adobe reader, the equation is perfect, it IS postscript inside, GSVIEW can see it, but Corel just refuses everything! Thank you very much, you would really help me on this! Although the question is quite old, I believe that this answer might help others with the same or a similar problem. As @KingOliver already mentioned, using LaTeX is a good way for typesetting mathematical formula and equations. A better solution, than dowloading GIFs without any option to change the equations after inserting, might be to "integrate" LaTeX using VBA. Jan Bender has done some work in VBA and is offering his CorelDRAW "add-in" for free. The add-in will allow you to insert objects, typeset by LaTeX, into your CorelDRAW file as a group of curve objects. These curves can be formatted like any other in CorelDRAW. And last but not least, it is possible to change the formula after inserting, since its LaTeX-code is stored as object data variable. Instruction on how to install it, combined with some troubleshooting, can be found here. @sergeydyadyul has it right for the most part. Let me tell you a little background on your problems. 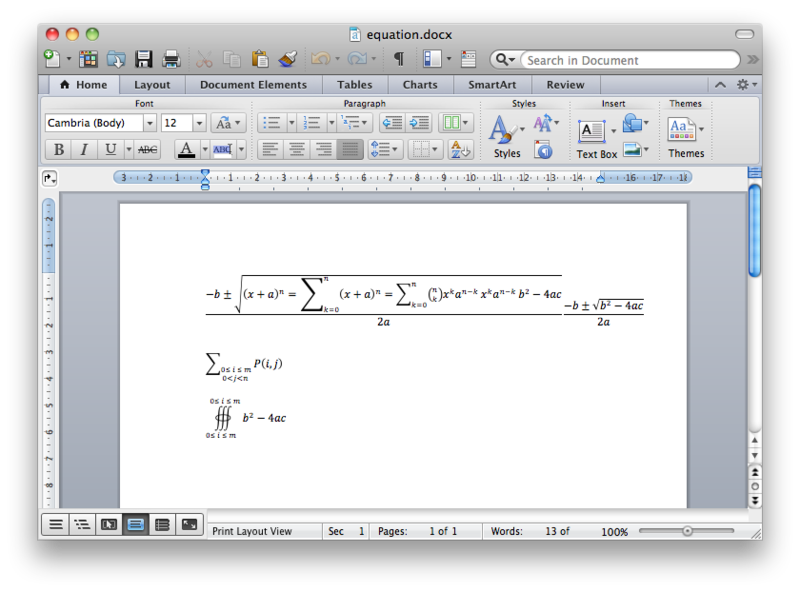 The equations that you create in MS Word are using symbols that are part of the Cambria Math typeface. When you attempt to create an EPS or PS file to import into Corel, it is not embedding the font into the document. So when you try to import the document into Corel it doesn't know which font it should be using to display the equation symbols. You will need to outline your fonts (convert them to paths) before you can import the equation into Corel. The problem is how do you outline your fonts? If you know any print providers, they will have prepress tools that can convert the fonts inside PDFs to outlines. Additionally, if you are passingly fluent in LaTeX, a mathematical typesetter, you can use this link and download the GIF that is your equation. It cuts it out for you as well. Not the answer you're looking for? Browse other questions tagged text pdf corel-draw jpg or ask your own question.